This location seriously soothes your soul. It oozes peace. It’s almost like a green-tinted massage for hurt minds and tired eyes. Psychologically speaking, green is known as a restorative color, indicating rebirth and renewal through its association with nature and spring. 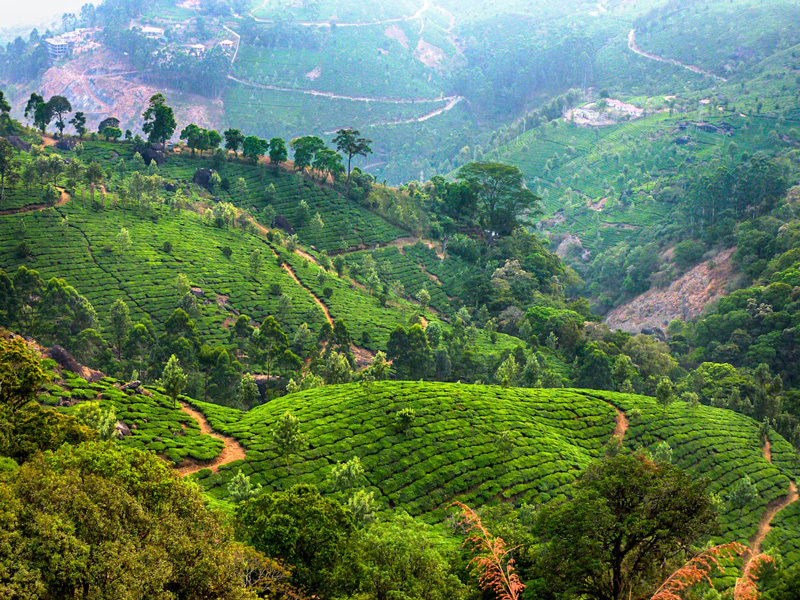 It is seen as a steadying, balancing shade, and Munnar certainly embodies that. Even the tea is green, with all the health benefits that brings. The blue of the sky and the lush greens of the tea plantations are not the only colors to be seen, however. The women’s saris are a riot of bright shades and the flowers are vivid dots of surprise to be sought out among the green tints. There are eucalyptus trees here too, tall and straight. I mentioned the lake. There is a lot of water here, as the hill station is at the confluence of three rivers. The weather is important here; it’s why the tea industry is so successful. This high up the mountainside, you can see clouds beneath you and mist rising from the lower valleys towards you. Clouds scud by above, seemingly so close you could almost touch them at times. The taxis, like the spelling, are unique. Auto-rickshaws, also called tuk-tuks or autos, are everywhere in Asia, and although the basic shape is the same – the cabin on a motorcycle body – each is decorated differently by its owner. Up here they’re a sensible way to get around, being small and more maneuverable than cars. The roads suffer from the rains and infrequent bus transportation is often the result. These little bikes can get around most things though, so they’re worth a ride. By the way, the OMBLET was delicious.